Of special note to me is the USAF symbol on the side. Perhaps you had an early premonition your brother would wind up in the Air Force? Looks like you invented the Hum-Vee. Just think how many lives you saved–royalty enough? Bill: I guess I thought that was a cool logo! Rich: I am still looking for that first royalty check. 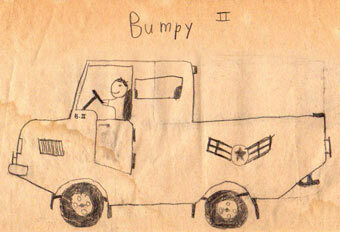 Johanna: If the road is rough enough, even the best of SUVs are bumpy. You look so happy! haha.